Early start yesterday ~ train to catch. Once in London I route marched from Charing Cross to Liberty in record time, on a mission to capture some morning shots of Nicky Tibbles, Wild at Heart flowers. There, at the main entrance on Great Marlborough Street. they shine against the black tudor timber. Just enough time for a twirl around inside, so many lovely things in the Stationery Department at the moment, aaarrrghhhhh! 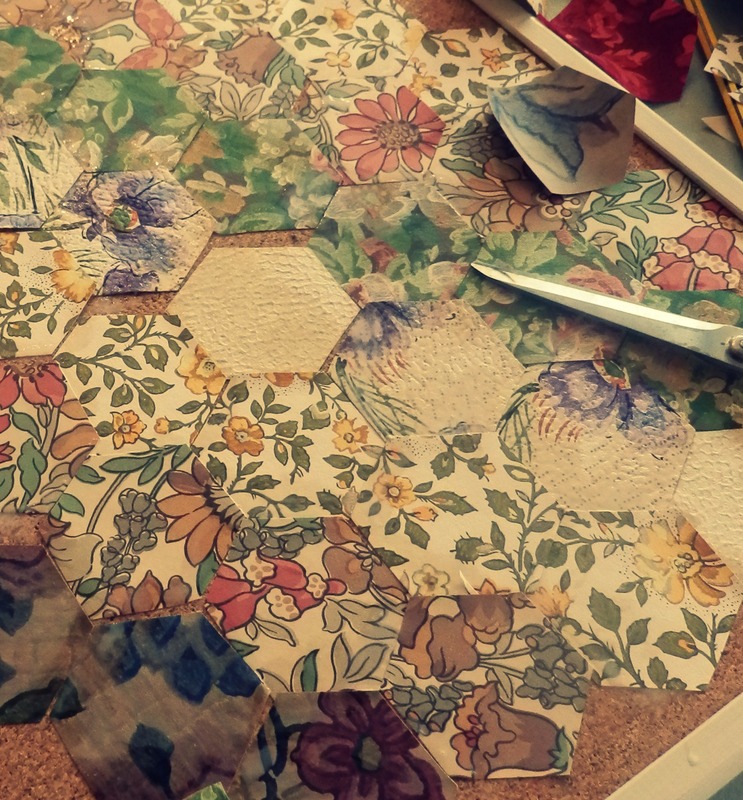 The real reason for my trip was to join Sarah Moore for her masterclass at the Liberty Sewing School. 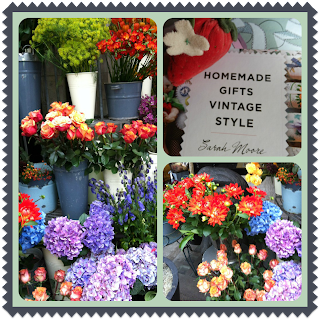 You may be thinking, Sarah Moore? sounds familiar, and you'd be right! 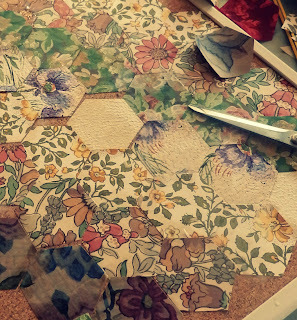 Country Living magazine have a new "simple makes" series featuring Sarah's lovely projects. ...so a glorious day ensued. I do so admire generosity and Sarah has it in spades. 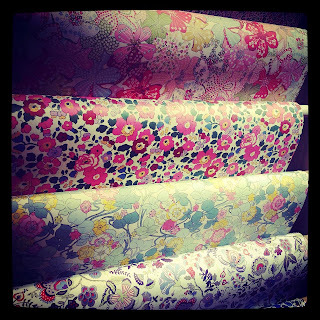 Vintage wallpapers, pretty buttons, bindings, antique velvet, welsh wool blankets spilled forth from baskets and crates and we could help ourselves! My corsage turned into a rosette....couldn't resist the blanket fringe! And to finish? 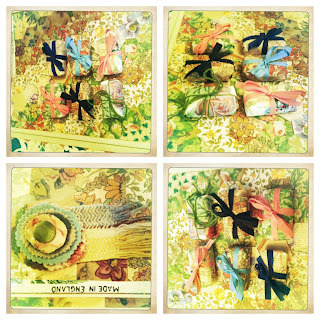 We wrapped soaps in vintage papers, so simple and so gorgeous...look out Christmas! I heartily recommend Sarah's book and her Country Living series. I found her easy, relaxed confidence both refreshing and inspirational, I will be buying her book as a gift and as a go-to resource for lovely vintage inspired projects. Happy weekend to you all, can't wait to hear about what you are making in readiness for the Jolly Season! It sounds like you had a lovely day, thanks for sharing it. That sounds a wonderful day out. 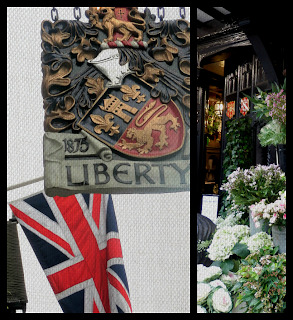 I love Liberty my Mum used to take me there for tea and cakes when I was a child. What a wonderful place to do a master class. I have been enjoying Sarah's articles in Country Living too. 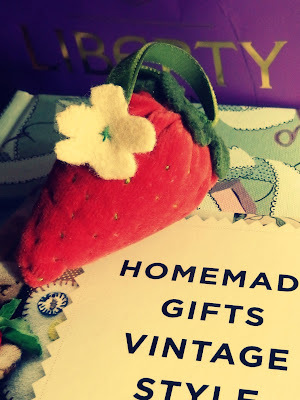 You made such lovely things, I especially love that strawberry pin cushion! What a spectacular day out that was! In such fab surroundings too. Love your new makes. Bet you are all fired up with even more creative ideas now! 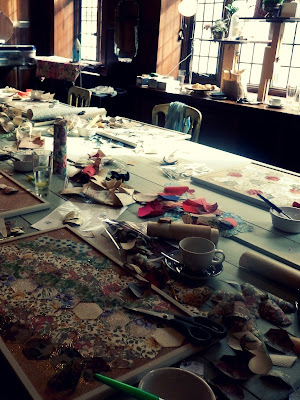 Sounds like a lovely and fun day out, you made some lovely things. 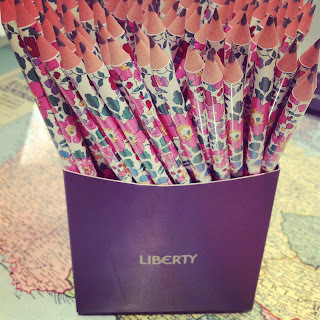 Looks like you had a fabulous time, it sounds like Liberty's is almost becoming your second home! Your strawberry is so cute! Sounds like you had a fabulous day, just love the strawberry you made. How delicious! How did you find out about Liberty classes? join the Sew Liberty club for all the details of up and coming classes. Oh Wow! What a lovely day. What a fun day that looks to have been ... I'm quite green. It's an age since I've travelled to London, it's such a very long way from North Wales! 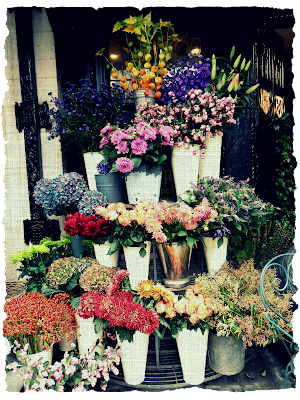 I'm always loitering by the flowers outside Liberty. Always so inspirational, and I haven't been arrested for stalking yet! What a coincidence, I was just looking through Sarah's book this morning for some inspiration! What a perfect strawberry. What a perfect post! What a FUN day you must have had. A definite wowzer! ...as if the flowers and fabrics weren't enough to make your trip worthwhile.